This initiative was one of those from the idea of "Fresh Expressions" that had been discussed at House Groups and was agreed upon subsequently at our ‘Away Day’ in 2007. Street Pastors are volunteers from a group of churches who patrol the town's pub and club area on Friday and Saturday nights from 10.00pm until 4.00am, caring for young people who need assistance or a sympathetic ear. They are supported by a Prayer Team, some at base and others committed to praying from home. Street Pastors is a national charity started by Ascension Trust in 2003 and operates in 23 London Boroughs and many towns and cities across the UK, such as Nottingham, Leiceister, Manchester, Portsmouth, Colchester, Southend and Romford. Wherever it is established, there has been a dramatic reduction is crime and anti-social behaviour. The first patrol of Chelmsford Street Pastors went out on the street on 11 April 2008. 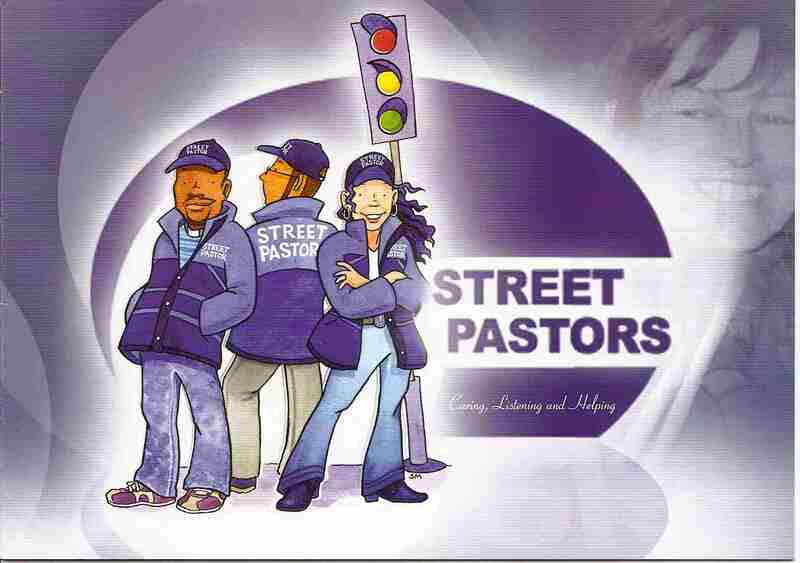 To date there are 13 churches involved in the scheme with 24 Street Pastors and 33 combined Prayer Partners. We are in the process of recruiting more Street Pastors with a view to starting our next course of training in November 2008. The criteria for those wishing to train is that they must be aged between 18 and 80 and must have been a member of a christian organisation for at least 18 months. Prayer Partners may join the team at anytime. As we enter our 7th year of work on the streets the Chelmsford Street pastors team have a tremendous amount for which to be thankful. We are grateful for the generous and ongoing support we have received from the Chelmsford city Council and our weekly cooperation with the Town Centre police. Our relationships with the door staff and club managers have continued to develop and we feel that we are an accepted part of the night economy in Chelmsford. Where we do need additional volunteers is for the prayer team at base, but several of the street team are willing to join the prayer team when we are short, so hopefully we can cover all the Wednesdays or Fridays and Saturdays through 2014. Our thanks to Gail Butler and Di Hodgkinson for organizing the training which has been done on a regional basis this year. We will have three new volunteers on the streets to join our teams from the latest round of training. We had an excellent ‘team leaders training day in mid May and had a good sharing session with the leader of the CCTV team at the city council on how we can be more effective on the streets, using their ‘eyes’ as they can observe the whole City center area. We had a good Fellowship morning in the Link in April when we brought together the three teams of volunteers to share in our 6th birthday. We are planning another on 6th Sept, again in the link to make sure our home prayers have the opportunity of joining in fellowship with the ‘Street’ and ‘base prayer’ teams. That would also be a good opportunity for anyone interested in finding out more about our work on the streets to meet up with lots of ‘Street Pastors’. In the meantime anyone seeking more information please ring Tony Lees on 01245 400338, or Gail Butler on 01621 854781. Volunteers can join in the work as a ‘base prayer’ or ‘home prayer’ with minimal training. Street team members need to 12 sessions of training, but can start on the streets after the first four. We are representatives of the whole Christian community, expressing concern, prayer and practical help towards those who use the night economy in our much loved City of Chelmsford.